Conceived and birthed in the conventional manner amidst the natural beauty of Dunbartonshire, David Byrne was transplanted away from his homeland at the age of two when his father received an opportunity for a job in Canada. Around the age of seven a second major relocation took place, this time taking him to the decidedly unnatural surroundings of Baltimore; a regular migration to different parts of the city's suburbs followed up into his teen years. It was during this period that the emerging music scene led by The Beatles and Bob Dylan inspired him to teach himself the acoustic guitar, and by junior high school Byrne had become active in a covers band named Revelation. In high school his musical activities took the form of somewhat left-of-center solo performances, and this approach carried over into his term at the Rhode Island School of Design, where he branched out into conceptually-based art. Disillusioned by the elitist attitudes of the campus, Byrne dropped out before completing his first year -- but not before making the acquaintance of lapsed drummer Chris Frantz, with whom he would later (after spending a year in Baltimore as part of a duo act named Bizadi) form the high-volume rock band The Artistics. Primarily focused on interpreting primitive pop tunes by bands such as The Troggs, The Artistics eventually began integrating some original songs into their setlist, the first of these being a track called Psycho Killer. In the early half of 1974 The Artistics ceased to exist, at which time Byrne made the decision to move to New York in order to concentrate on his songwriting. After completing their studies at RISD, Frantz and his girlfriend Tina Weymouth joined him there, and before long their musical collaboration resumed (non-musician Weymouth taking up the bass guitar when no other candidates for the instrument could be found). Six months of private rehearsals ensued before the trio's first public performance: calling themselves Talking Heads, they opened a show by The Ramones at the nearby Bowery club CBGB. The band's popularity quickly spread, and with the support (and abuse) of Lou Reed, some of the major labels began to take an interest; in the end the Heads signed with the New York-based independent label Sire (eventually devoured by the great beast Warner Brothers) and issued the 7" Love Goes To Building On Fire b/w New Feeling (1977). Fourth member Jerry Harrison was added shortly afterwards. With the release of their full-length debut Talking Heads: 77 the band established an international audience for itself, which the subsequent releases More Songs About Buildings and Food (1978), Fear of Music (1979), and Remain in Light (1980) effectively served to broaden. These three releases also marked the first collaborative efforts between Byrne and Brian Eno, a partnership that resulted in a denser, more complex sound for the Heads' recordings (although it also created some tension within the band -- a result of the pair's tendency to assume credit for the other members' contributions). A full-scale collaboration between Byrne and Eno, My Life in the Bush of Ghosts, materialized in early 1981, followed by Eno's participation in Byrne's score for Twyla Tharp's dance production The Catherine Wheel. The singer's association with Eno also brought about his involvement with the Robert Fripp album Under Heavy Manners/God Save the Queen (1979), and the guitarist's reciprocal appearance on the Talking Heads song "I Zimbra" from Fear of Music. As the 1980s progressed, Talking Heads became one of the most successful bands of the decade -- a result of their dynamic live shows (now utilizing an expanded line-up with up to five additional musicians), popular singles such as Burning Down the House (from Speaking in Tongues, 1983), and visually inventive promotional videos (which benefited from heavy rotation on MTV). The decade also ushered in Byrne's first ventures into the medium of film, beginning with the Jonathan Demme-directed Talking Heads concert movie Stop Making Sense (1984) and culminating in his own full-length feature True Stories (1986) (starring, written and directed by the singer). Score composition continued as well, including productions for stage (The Knee Plays, 1985, created for Robert Wilson's The CIVIL warS) and screen (Bernardo Bertolucci's The Last Emperor, 1987 and Demme's Married to the Mob, 1988). After the 1988 album Naked, Talking Heads ceased activity (barring a few tracks recorded for the Wim Wenders film Until the End of the World, 1991), officially announcing their dissolution in 1991. In 1988 David Byrne established Luaka Bop, a label that allowed the singer to make more widely available the international (particularly Brazilian) musics that interested him. The label also became the outlet for his solo releases, the first of which -- 1989's Rei Momo -- placed his love of Latin rhythms (already clearly evident on Naked) at the forefront, and for which he enlisted the participation of a large ensemble of New York-based Latin performers. 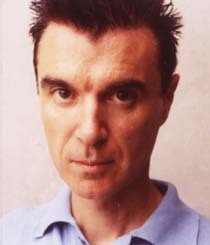 While his regional influence continued to inform the compositions on his later solo albums -- Uh-oh (1992), David Byrne (1994), Feelings (1997) -- a drift back towards the style he had developed with Talking Heads gradually took prominence once again (although still leaving room for new influences, such as the "trip-hop" stylings on Feelings). Other projects allowed him to explore even more diverse styles, such as his orchestral score for Robert Wilson's theater production The Forest (1991), and the atmospheres created for the dance piece In Spite of Wishing and Wanting (1999). During the 1990s Byrne extended his range of activity even further, exhibiting his photographic and design work on an international scale and creating a number of public art displays using billboards, subway posters and questionnaires. The first of his published works, the notebook-styled art book Strange Ritual, was issued through Chronicle Books in 1995; subsequent publications explored the formats of corporate propaganda (Your Action World, 1999) and even the Bible (The New Sins, 2001 -- copies of which were planted in hotel rooms in place of actual bibles). From there, Byrne moved into an exploration of PowerPoint presentation software as an artistic medium, the results of which were presented in the book Envisioning Emotional Epistemological Information (2003). In the 00s he continued his recorded work with the releases Look Into the Eyeball (2001) and Grown Backwards (2004), as well as adding to his list of score credits with Lead Us Not Into Temptation (2003), a soundtrack created for the David MacKenzie film Young Adam with the help of musicians from the Scottish bands Mogwai, Belle and Sebastian, The Delgados and Appendix Out.